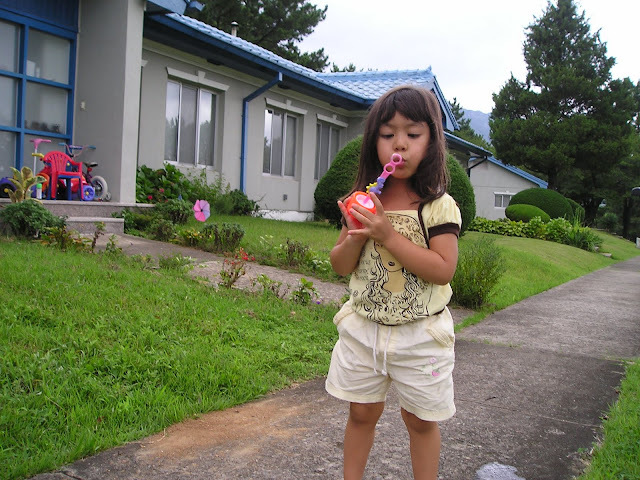 I posted these photos when we were still in Korea but posting it again here for Mommy Moment's theme this week. I got tired of browsing my photo folders si I just dug these photos at my archive in blog hehehe. 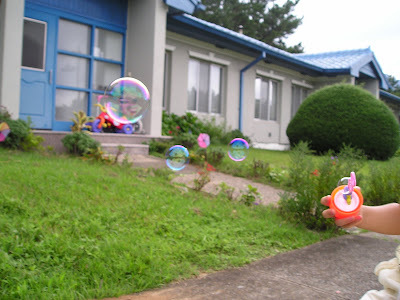 We always have stock of bubbles at home because the kids love to blow them. 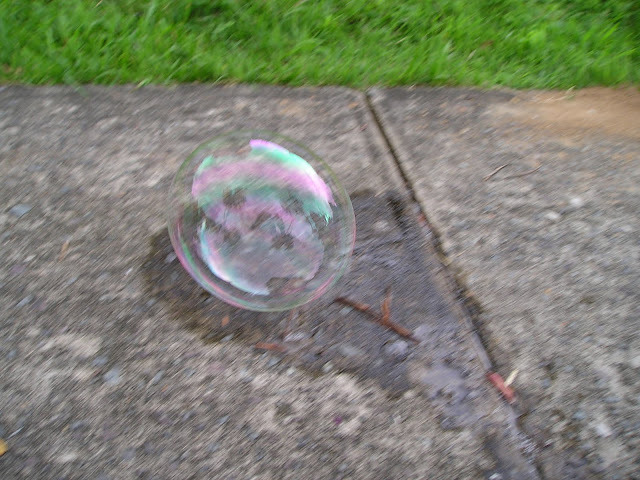 I would not want to be a bubble because your life span is just a matter of seconds. 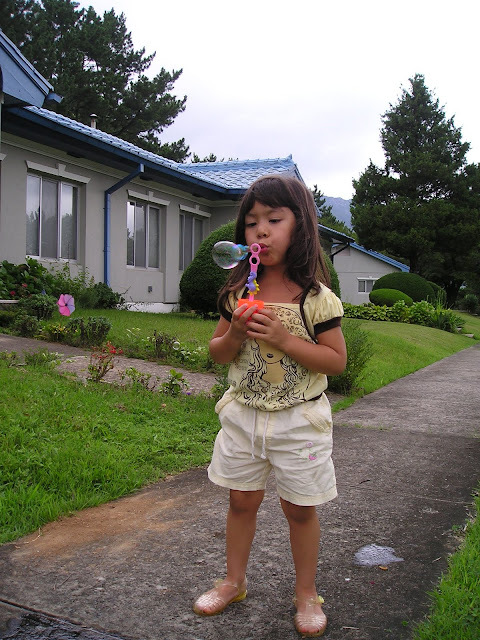 EJ misses this house very much, we all do..
natawa ko sa remark mo, "I would not want to be a bubble because your life span is just a matter of seconds." yet it's true, lol. 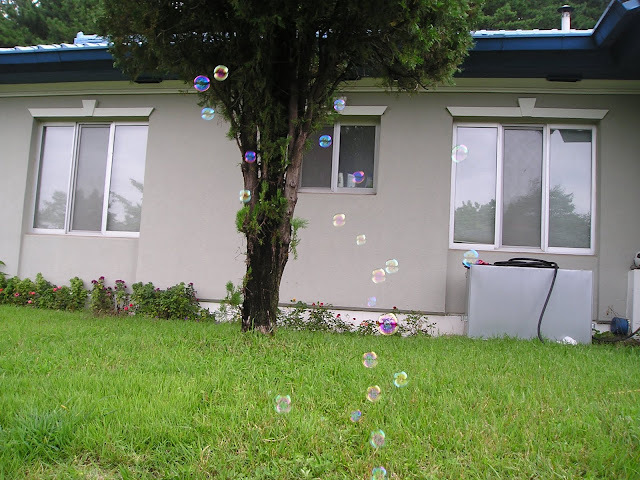 Really bubbly bubble photos. Nice yard po. galing mo tokaya, una ka ngayon. ang ganda talaga ni Rylie. ang haba na ng buhok nya ano? My,how she's grown pretty and healthy! Love every moment for she won't be a little girl forevermore. Only in your heart of course. 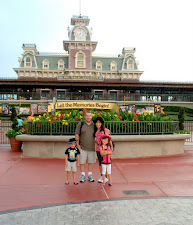 Sorry for being away from blogging for so long. Bubbles, bubbles, everywhere! 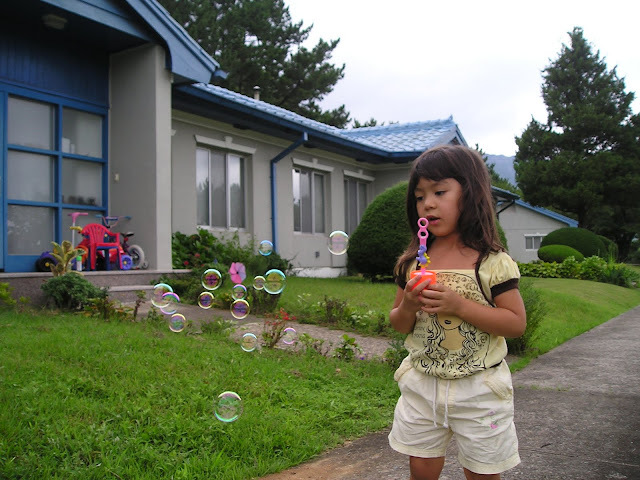 Blowing bubbles is so much fun for kids no matter where they are, inside or outside the house. I have an award for you, by the way! the bubble photos are great! 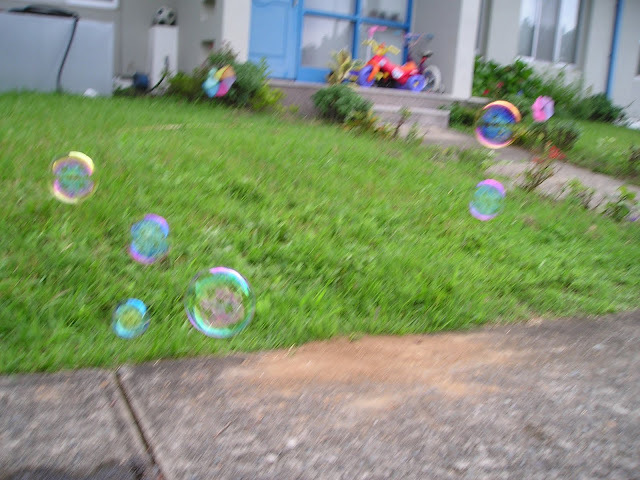 the bubbles showed different colours while flying through the air. dami bubbles at enjoy na enjoy si Rylie. 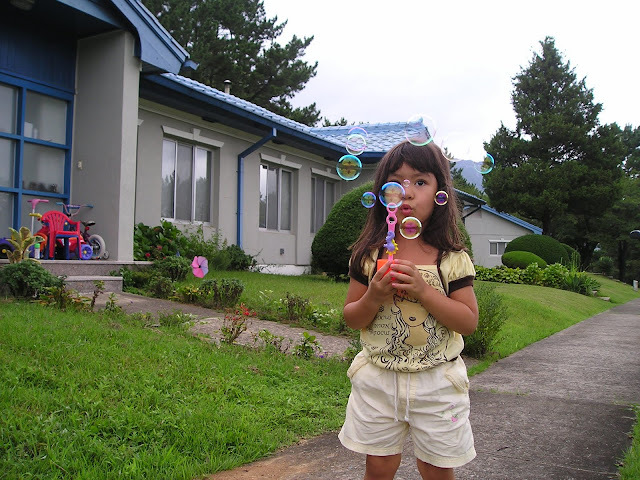 Yes, kids everywhere are addictive to blowing bubbles. There's something in them that stirs the imagination of kids. When I was a kid, I used to blow cotton I gathered from our sofa and imagine them to being clouds when they reached the sky. I ended up being spank by my mother because of the big hole in our sofa, lol. Thanks for the post. God bless you all always. Oh wow, I love bubbbles. Haven't tried it yet with George. Maybe this Halloween? What wonderful memories :o) What a cutie! And I do like the blue roof on your house. After returning from our visit with family, it was straight to work, but I had yesterday and today off from work, so I hope to get caught up on some blog reading. I did draw names and I just wanted to let you know-in appreciation to those that left comments but were not drawn, I am also offering 10% off of one order…I want to be sure that no one was left out. Please leave a comment to let me know if you are interested. oh! i love your bubbles! they are of various wonderful colors! dito pla naka post tong bubbles mo sis....muntik ko nang mamiss...sensya na po...ehehe! 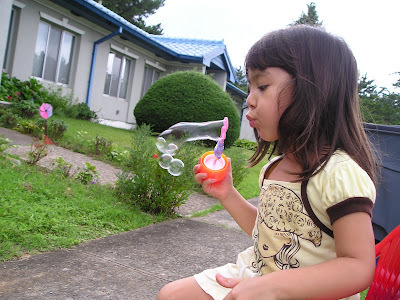 wow, I love Rye's bubbles...ang laki...eheheh! salamat sa dalaw badingding...bukas na ako rarampa...ala na akong powers...salamat sa dalaw at comments...mwa!